Royal Enfield has launched two new colour variants of its bestselling motorcycle variant, Classic – Gunmetal Grey in 350cc and Stealth Black in the 500cc variant. Both the new colours are matt finished. The Gunmetal Grey is priced at Rs. 1,59,677 while the Classic 500 Stealth Black is priced at Rs. 2,05,213 lakh. Both prices are ex-showroom, Chennai. Also read: LEAKED!! ROYAL ENFIELD CLASSIC 350 / 500 WITH REAR DISC AND THUNDERBIRD’S SWINGARM !! 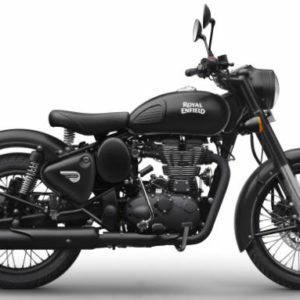 The two important changes to be seen on both the Royal Enfield Classic 350 Gun Grey and Stealth Black 500 are rear disc brake and swing arm from the Thunderbird range. The Classic 350 is powered by 346cc single-cylinder engine. The carburetted engine produces a maximum power of 19.8 Bhp at 5250 rpm while torque peaks at 4,000 rpm. The engine is mated to a five-speed transmission. The Classic 500 is powered by a fuel injected, 499cc single-cylinder engine that generates a maximum power of 27.2 Bhp at 5,250 rpm and peak torque of 41.3 Nm at 4,000 rpm. The engine is mated to a five-speed transmission.